chicken cutlet sandwich: a cut above the rest. some sandwich traditions are time-honored. they whether the ages, beat the odds, and become immortalized in the proverbial sandwich hall of fame. they become so famous we can no longer imagine a world without them. everybody knows their names by heart. names like blt, reuben, hot ham and cheese, and club sandwich. but this post isn’t about their stories. this post is about the other guys. the underdogs. this post is about one of the sandwiches which is still fighting the good fight, climbing the ladder to infinite fame and eternal sandwich recognition. this post is about a sandwich which has faced countless obstacles and still kept on keeping on. this is the sad sad story of the chicken cutlet. “what’s the big deal, poor man? it is just fried chicken on a bun.” and i bet you think the glass if half empty, don’t you. the word “just” doesn’t belong in a sentence about fried chicken on a bun. i can think of some other words that do, though. like maybe “amazing,” or “highly underrated.” that’s two words, but you get the point. the chicken cutlet sandwich, like nuclear fission and gmo production, is a great idea perverted by bad people. as soon as we figured out how to put fried chicken on a sandwich, fast food chains started to crawl out of the woodworks. the whispered sweet nothings and let a good sandwich astray. they slathered it in mayonaisse and abused it with shredded iceburg lettuce. they muzzled it with warm, soggy pickles. they shackled it with the obligatory side order of fried starch and massive soft drink. they did everything within their power to max out the full factor and bring down the price. well, this poor man has had enough. i want a chicken cutlet sandwich that tastes fresh. i want it to have crunch, and fresh veggies, and a homemade dressing. i want it to be served on homemade bread which has texture. i want the chicken itself to be succulent, flavorful, and worthy of my time. but i’m a doer, not a dreamer. so i popped in the lab (i.e. kitchen), put in the manhours, and made myself a chicken cutlet sandwich which would knock the tastebuds off any corporate fast food big-wig i am likely to meet. sandwich hall of fame, here we come. before you start cooking, ready your tomato-basil mayo. one tablepoon of tomato paste, 2 or 3 tablespoons of mayo, a half teaspoon of garlic powder, and a few leaves of finely minced fresh basil should do the trick. this sauce isn’t necessary, but it is a staple for me when i make this sandwich. there is something about the zip it adds that i just can’t do without. get yourself two plates or shallow bowls. beat the eggs in one of them. in the other, add about a half inch of panko. your dredging station is now ready for business. next, ready a large ziploc bag or tightly sealing container. add the flour, black pepper, garlic powder, salt, oregano, parsley, and hot pepper flake. seal the bag and give it a good shake for a few minutes to make sure all the ingredients are well mixed. remove the skin from your chicken breasts, set them on a cutting board, place a piece of plastic wrap over the top, and beat the ever-loving tar out of them with a meat tenderizer or rolling pin. just go at it for a while until they have flattened out to about 1/2 to 1/3 of an inch. remember, work the meat from the center out, not vice versa. use a sharp knife to cut your pulverized chicken into cutlets. i like to use a very sharp knife to cut perfect squares. they look the prettiest by far. set your chicken squares aside. remember, don’t throw away any scraps you left when cutting your chicken shapes. you can still bread and try those (for some tasty chicken strips) or use them in a stir-fry or something later. pour an inch or two of oil into a frying pan or deep pot. get the oil nice and hot. if you aren’t sure whether or not it has reached the appropriate temperature, grab a few little crumbs of panko and drop them in. if they gently sizzle, you should be good to go. try to keep in mind that your oil can actually become too hot for frying, which means you might want to turn down the heat on your stove once you reach what you deem your oil hot enough for frying. place two or three squares into the flour/spice bag and give them a good shake. make sure to shake any excess off when you remove them. give them a quick, even coating in the egg dipping station. lastly, gently press both sides into the panko plate. gently lay them into the pan of hot oil and watch them sizzle in deepfried glory. once they’ve turned golden brown, remove them and put them on a plate of papertowels to soak up some of the extra oil. repeat steps 8 through 10 until no chicken remains. while the chicken is cooling down a little, slice your veggies. the onion should be sliced as thin as possible (almost transparent is best), and the tomato should be cut into slices 1/4 inch thick or less. lastly, remove the base of the bunch of mizuna and cut the stalks into 1/2 inch pieces. toast them rolls for a few minutes. assemble your glorious sandwiches. 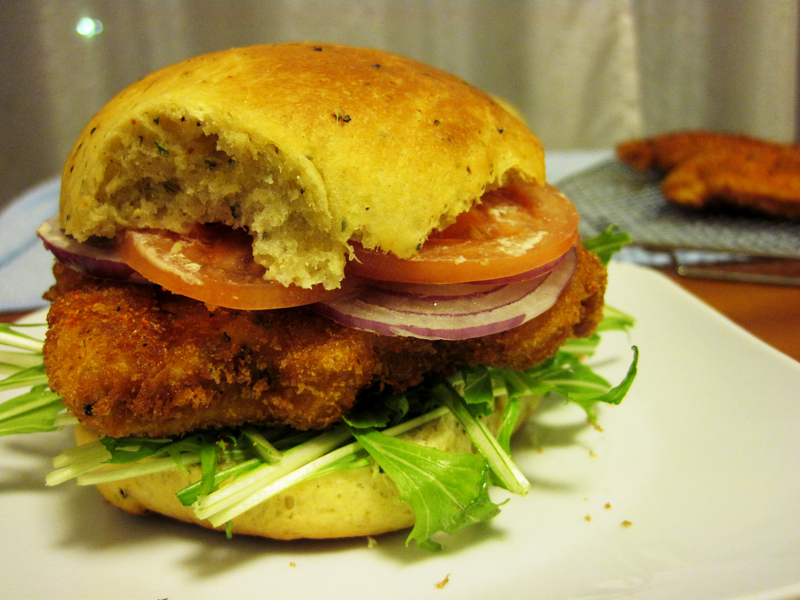 spread your sauce on both halves of the rolls, then stack mizuna, chicken, onion, and tomato in that order. fasten with a toothpick or wrap in a piece of wax paper. open a chicken cutlet sandwich stand in your driveway. wow your neighbors and friends. This entry was posted in dinner, eye candy, recipes and tagged Chicken, Fried chicken, Man Food, Sandwich. Bookmark the permalink. ← king trumpet mushrooms: because every party needs a fungi. thanks for the new year wishes! sorry i went awol for a little there, you know how the christmas season gets i’m sure. yeah, i’m a poor man who loves his sammiches. that being said, there is always room to improve. i’m heading over to the white cottage right now to check out your cutlets. and i’m glad you approve of the herbs. i would have liked to get my hands on a good provencal mix, but beggers can’t be choosers as they say. I’m starting another blog and love your format but looked at the standard which has lines round the photos – hate. How did you get rid of them? BTW as I have said to you before – you make food look glorious. generally, my ability to make food look glorious is rivaled only by my inability to understand how the heck wordpress works. however, in this particuarly occasion, i can answer with certainty. at the bottom of your posts, there should be an option to set a “featured photo.” once set, the photo will appear (unfettered by heinous white framing) at the top of that post. hope that helps. as always, thanks for being a dear, mrs carmichel. Thank you Sir. I know I MAKE it work but i’m equally sure it’s not the right way to do it. Others seem so clever. I love it. I also love “a great idea perverted by bad people”. So true of so many once great dishes. thanks, conor. glad you enjoyed the post. that is actually the new theme behind a bunch of posts i am currently working on. our world seems to be rife with misunderstood/highly underrated/poorly executed foods that, truth be told, are absolutely delicious. the first one that came to mind was okra, but if you have any suggestions you might like to see, feel free to give me a shout. thanks, it was quite tasty. the homemade buns were really what took it to the next level. if you making them, let me know if have any suggestions.